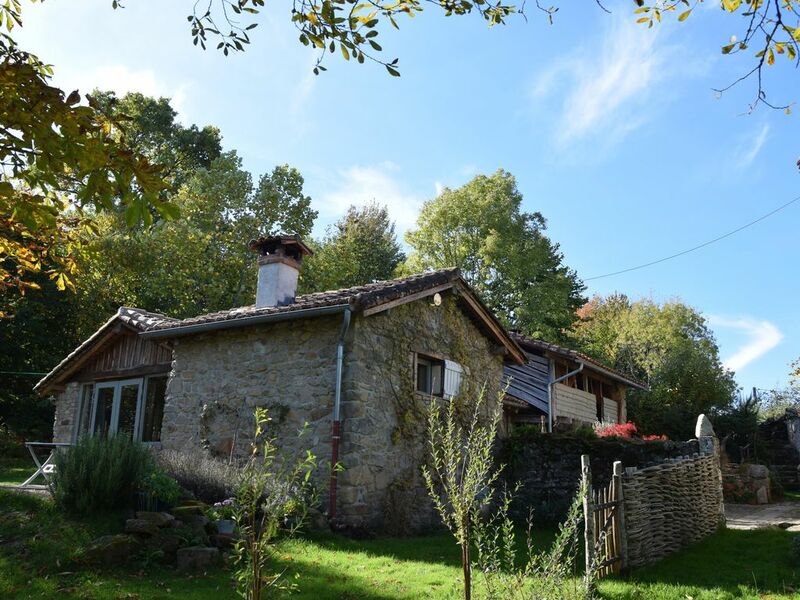 La Maison d'Amis is a traditional detached stone Perigourdin cottage located within Perigord /Limousin Regional Natural Park. This one bedroom property is spacious and airy with wonderful high ceilings and stone walls. Separated by a courtyard and large barn from the owners house it is very private and has it's own garden with views across the valley and meadow and backing onto a small wood where you are free to walk the footpaths which the owners keep clear. Great for bird watchers and nature lovers, we have seen black woodpeckers, tree creepers, nut hatches and hoopoes amongst many others .It is an ideal retreat for a peaceful break, perfect for couples or friends. The road to Chez Neymard and La Maison d'Amis is literally on the way to nowhere, we are at the end of a single track road, so peace and quiet is assured. The owners cultivate willows in their garden for their basket making workshop and have a studio/atelier which guests are welcome to visit and watch the basket making process. Adrian and I ran our willow basket making business in England since 1985. We moved to France in 2013 to semi retire, still growing our willows and selling our baskets but hopefully working a bit less. (well that was the plan!!) Since moving here I have concentrated on our organic garden and the gite and Adrian is busy with baskets and courses. We live here full time now, our son attends the college in Nontron and if we have free time we like to head off in our camper to continue the pleasures of discovering La Belle France. We always enjoyed living in the country in the UK and wanted a similar rural setting in France. Although we know Provence better than the Dordogne we prefer the landscape and the climate in this part of France so decided to concentrate our search in The Perigord Vert. When we first saw Chez Neymard and La Maison d'Amis we were smitten and since moving here we have discovered what makes this part of the Perigord so appealing. There is a gentleness and intimacy about the view of the valley from La Maison d'Amis and even on grey days the mists that hang in the valley slowly lift to reveal the church steeple of nearby Champs Romain to the north and the patchwork of fields and broadleaved woodlands to the east. La Maison d'Amis is ideally suited for couples looking for a relaxing break in an unspoilt rural location. Tastefully renovated and in it's fifth season it is perfect for walking, birdwatching, swimming, (St Saud Lake, 6.5 miles), kayaking on the Dronne, cycling or just taking it easy and enjoying the fresh air and tranquility. People with a love of crafts will enjoy the basket studio and workshop and could combine a course with a break for a holiday with a difference. Large spacious lounge with woodblock flooring, beamed ceilings, stone walls. Windows to garden and woodland. Two and three seater sofas. 32" satellite t.v, dvd and cd player, wood burner. Dining table, 6 chairs & dresser. Fully equipped character kitchen with gas hob and electric oven. Microwave, dishwasher, washing machine, fridge freezer, toaster, coffee machine, wood burner, beamed ceiling, stone walls, tiled floor, shuttered windows onto courtyard and garden. Characterful cottage in tranquil woodland setting. The cottage is well designed on one floor and has several outside seating areas. We enjoyed the peace and quiet and wonderful views from the bedroom. The living/dining area was very comfortable. The cottage was shaded and lovely and cool to return to on a warm day. Adrian and Ruth were very friendly; approachable and informative but never intrusive. Périgord Vert is a rural; scenic part of the Dordogne with lots of walking trails and lakes to enjoy. Lovely place, beautiful surroundings and very peaceful. Fantastic cottage and views of the country side. A place to chill and relax. Cottage is fantastic with great views of the surrounding areas. If you like peace and quiet and want a chilled holiday this cottage is for you. My partner and I have just returned from a week long stay. The weather was perfect and the Perigord Vert is of course superb. This "Gite" is the very best self catering holiday (and holiday) that we have had .. unfortunately there are only 5 stars to award. Adrian and Ruth have clearly spent a great deal of time creating and preparing the perfect location for anyone who wants to stay and it does show. And it is as if the local wildlife is in on the arrangements as well. For anyone who loves rural France or the countryside and dreams about a country idyll break without noise or interruption, here it is! "Things to see and do" are in abundance in this area of France, whether you want culture or history, activities or the small rural town life, and many seem to be " .. about 20 minutes away". It's true. Admittedly there are many other attractions that are anything up to 45 minutes away .. but we ran out of time this year and the inclination to just stay in the garden and wander around the local woods was too great! Even if you already live in a rural area of your own country (we do) but want a break somewhere new, our recommendation is to try out this lovely part of the world. Listing the wildlife will take up too much valuable time ..Thank you for a great stay. outstanding views, peace and tranquility a complete haven! I could write a book about this place if I was good with words. Don't know where to start... we arrived on 26/05/2018 stayed for one week. The weather wasn't the best but that didn't affect us. That place is lovely when it rains, magnificent when it's dry and peaceful all the time. Adrian and Ruth have done a great job with inside and outside of the villa. We spent most of our time outside the bedroom, enjoying the beautiful views and bird songs. If you like peace and tranquillity, clean air, good food and great wine than don't look further. Adrian and Ruth, thank you ever so much for sharing your beautiful place and wishing you all the best for the future. Adrian runs residential, weekend courses and taster day willow basket making courses during the year from Atelier Chez Neymard. Have a look at the dates on the website if you would like to combine a holiday with learning a new skill. There is a wonderful lake beach at St Saud Lacoussiere which is 7 miles from La Maison d'Amis. Life guards, sandy beach, bar and very clean warm water. Open all summer for swimming and all year for walking/fishing. Further afield there is St Estephe lake which is similar, lovely lakeside walks, sandy beach, bars, restaurant, about 20 minutes by car. Nearest airport is Limoges, 50 mins by car. We are about 450 miles south-west of Calais and on auto routes can be reached in a day. We are very rural and a car is essential. Our nearest village is St Pardoux La Riviere, here you will find several bakers, butchers, chemists, hairdressers, bars, cafes, and a superb restaurant at the Hotel de France. St Jean De Cole is 20 mins by car and is one of the most beautiful villages in France. Brantome, the "Venice of the Perigord" also 20 mins, has first class restaurants and a busy Friday market. The spectacular caves of Villars are 15 mins away. The cities of Perigueux, Angouleme and Limoges are all within 50 mins. Markets are a part of everyday French life here in the Perigord which is renowned for the quality of it's food and drink. If you wanted to you could visit a different market almost everyday of the week. Monday tends to be quiet but Tuesday there is a small market in Saint Pardoux, Wednesdays is the famous Piegut Pluviers market. Thursday St Astier, Friday beautiful Brantome or bustling Riberac. Saturday try Thiviers or Nontron and on Sunday visit Jumilac le Grand both for the market and the impressive Chateau. Booking Notes: To book please contact the owners by email or telephone to confirm your availability. We request a deposit of 25% of the total amount.. The remainder is to be paid 8 weeks before the arrival date. We also take winter lets and can offer special rates for a month or more. Please ask for details. Shorter stays by arrangement from £65 per night. Security deposit of 150 euros for any damages which is refunded 7 days after departure. Changeover Day: Changeover day at La Maison D'amis is usually Saturday but other days possible by arrangement. Shorter stays or long term lets please enquire.. We ask that you leave by 10 am and arrive after 4 pm which gives us time for cleaning and any garden work we may need to undertake around the property. Notes on prices: Prices include the use of all bath towels, bed linen, gas, water, electricity and WiFi. Wood for heating in the winter months can be bought direct from the owners at a reasonable cost.